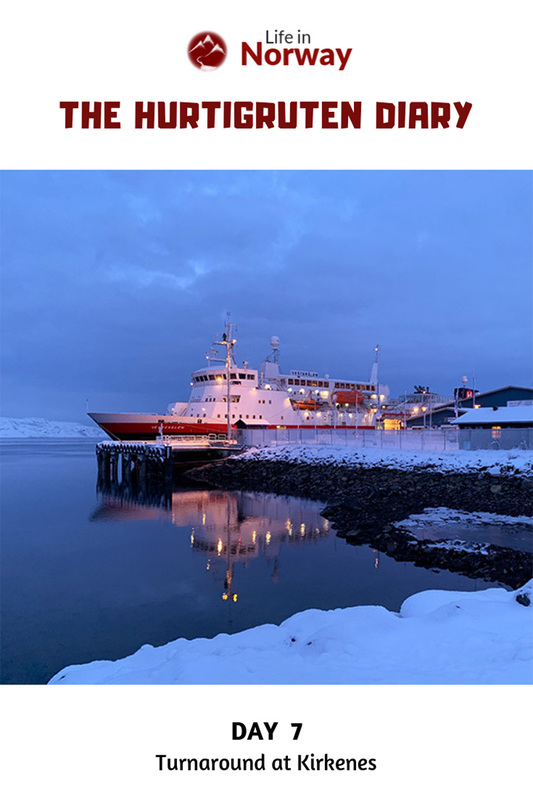 Hurtigruten Diary Day 7: After the turnaround port call at chilly Kirkenes, we begin the southbound leg of our epic winter journey along the Norwegian coast. Today was a strange day. 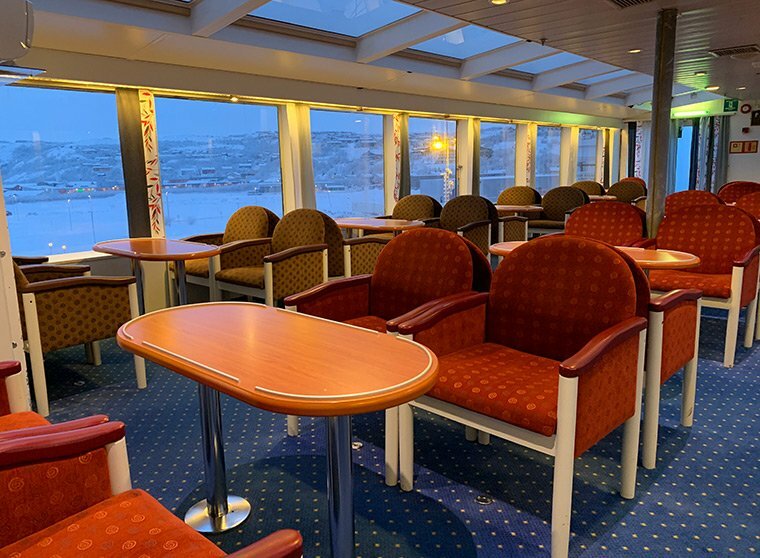 After a busy breakfast room, we lost more than 40 guests who'd taken the one-way voyage from Bergen to Kirkenes, with only a handful getting on for the southbound journey. 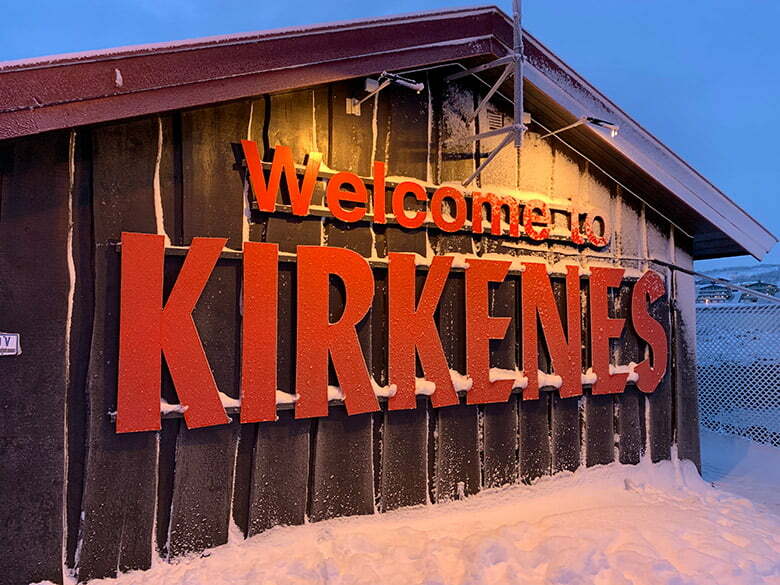 As you can see from this picture, the temperatures had dropped considerably overnight to around -12C/+10F, but that's still milder than I would expect for Kirkenes at this time of year. 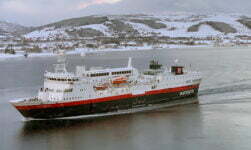 As I've been to Kirkenes twice before I chose to stay on the ship and catch up with some reading and writing. On top of the 40 or so checked out passengers, many more took buses to the Russian border, husky farm or into the city. This meant I had the panorama lounge all to myself so got to enjoy the subtle differences in light as the morning wore on. ‘King Neptune' also popped by to say goodbye, as his 22-day shift aboard had come to an end. Many of the people I've got to know over the past week have left the ship here. They include some of the more lively passengers – a large group of Americans and a young Italian couple – so I anticipate a quiet voyage back. Slightly surprising to me, I haven't even come close to getting bored so far, so it will be interesting to see if this changes over the coming days. My British, Dutch and German dinner companions are all here for the full voyage, so there will be some consistency at least on table 9! A quieter day means it's time to talk food. The food has been a real highlight of the voyage so far. While dinner is table service with reserved seating, breakfast and lunch are buffets with open seating. I would say lunch has been my favourite meal throughout the voyage, with fish the standout element of every meal. 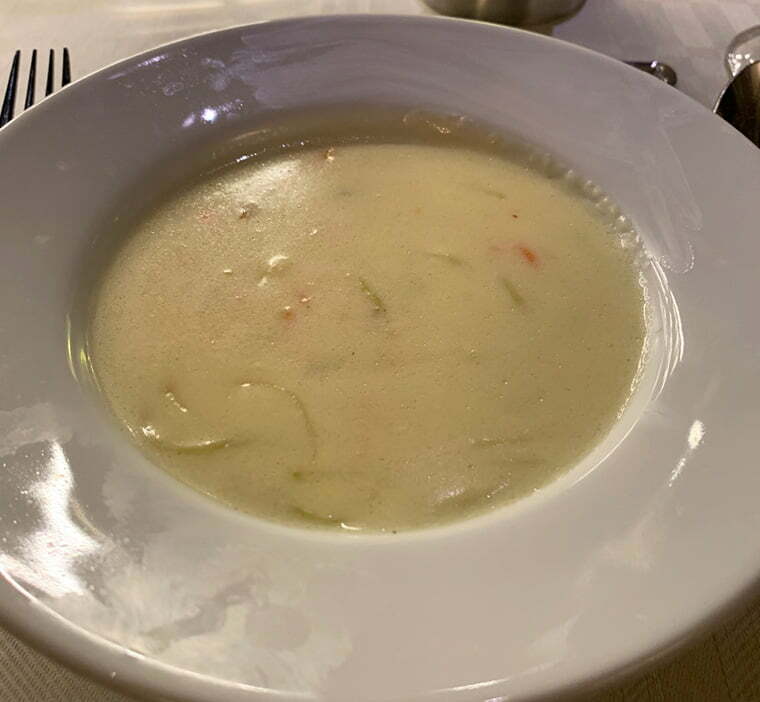 Considering the low number of passengers on board, there is a good selection of what I would call Norwegian style lunch – bread, pålegg (cold cuts, toppings etc), herring, salads – and hot food that varies every day. 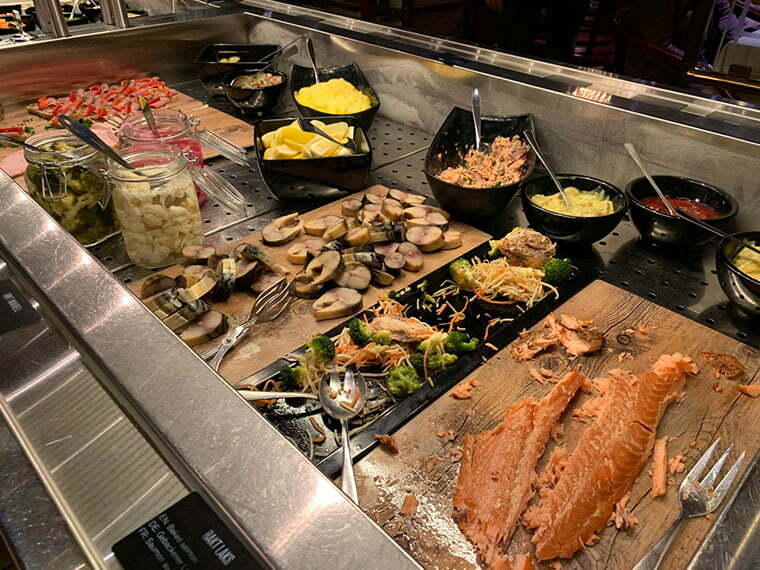 For example, in addition to the cold food buffet you see in these pictures, the hot food selection for today included fårikål (the Norwegian national dish), baked salmon, risotto, pasta and a bolognese sauce. 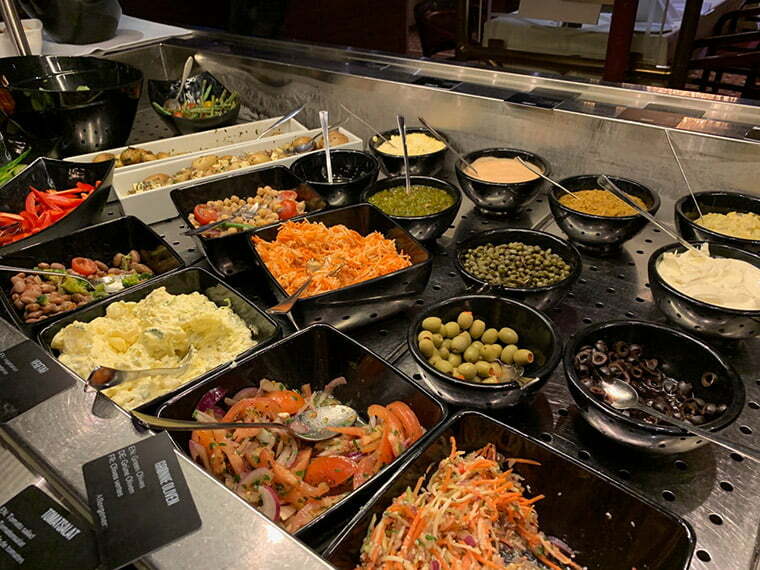 One other downside – and now we're really getting into the details – some of the British guests have said that they find the white-on-black text on the food labels hard to read. I've tended just to glance at the Norwegian (which is the larger text at the top) so hadn't thought much about it, but when you're relying on the smaller translated text it is indeed difficult to read. The vast majority of dinner guests on the voyage don't read Norwegian, so it seems a little strange to have the Norwegian text displayed so prominently. Because Brits don't tend to complain in person, I let the hotel manager know on their behalf! 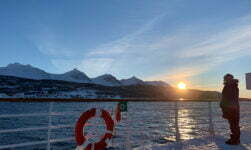 Between Kirkenes and Vardø I spent around half-an-hour up on Deck F watching the light slowly disappear. 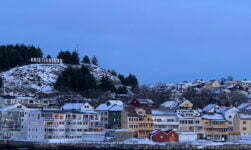 This time of day – around 2.20pm – at this time of year – January – in this part of Norway – the far north – is simply stunning. Oh okay, just a few! 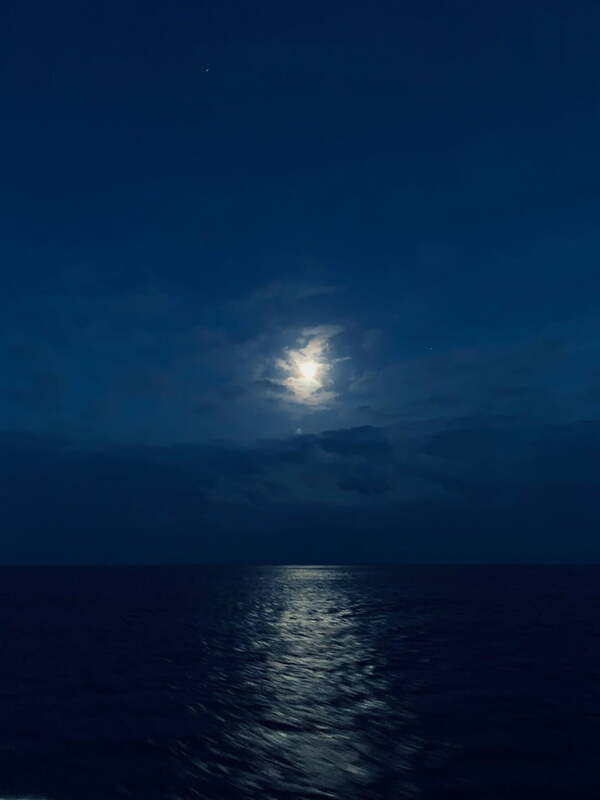 One thing that has surprised me is the lack of guests out on deck at times like this. 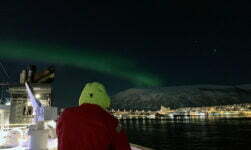 Many are on the voyage hoping to see the northern lights, but the ‘winter light' of Norway is about so much more than the tricky green lady. Many of course are content just to enjoy the excursions and a full-board hotel experience for 11 nights – and that's fair enough I suppose! But I do think they're missing out. 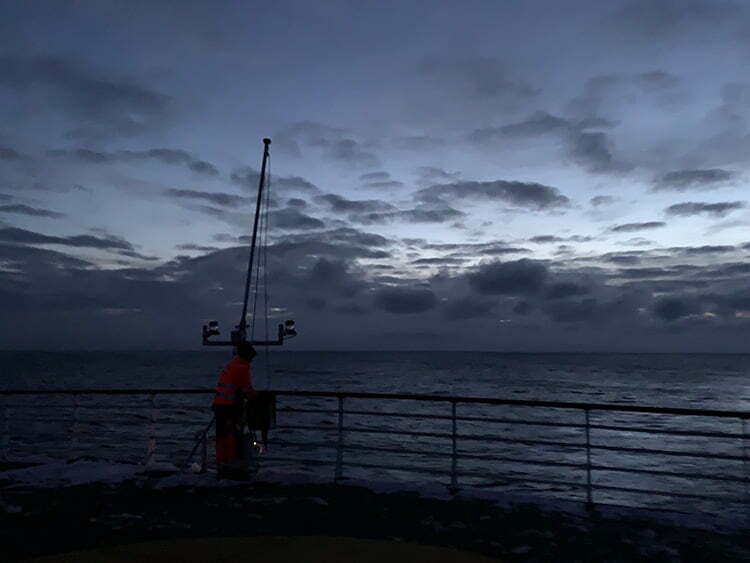 I also watched one of the crew battling with the wind to remove the flag, which I'm told put up at sunrise and take down at sunset every day. Of course, we don't actually have sunset right now, but I'm sure there's a designated time for such cases! 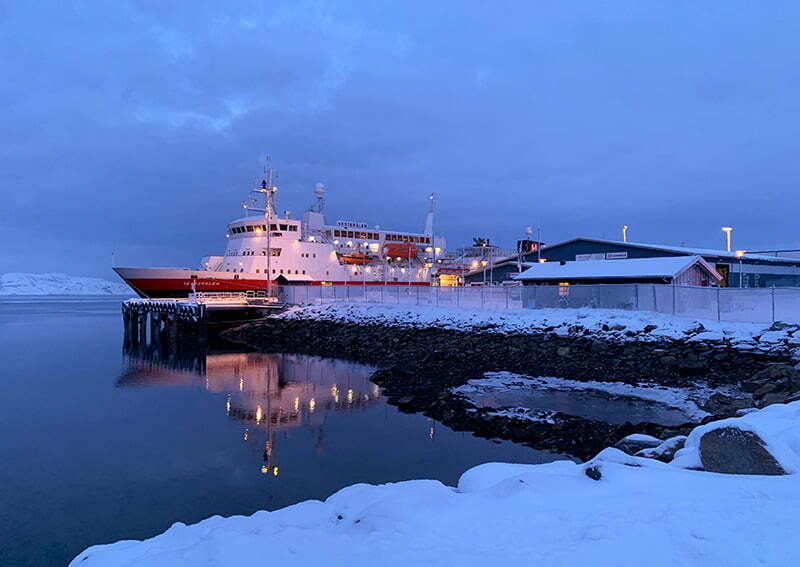 In the early evening we had a one-hour stop at Vardø. I had intended on visiting the witch memorial, but a combination of the darkness, the snow, and also wanting to see the fortress meant I didn't quite get there – although I did get a glimpse! 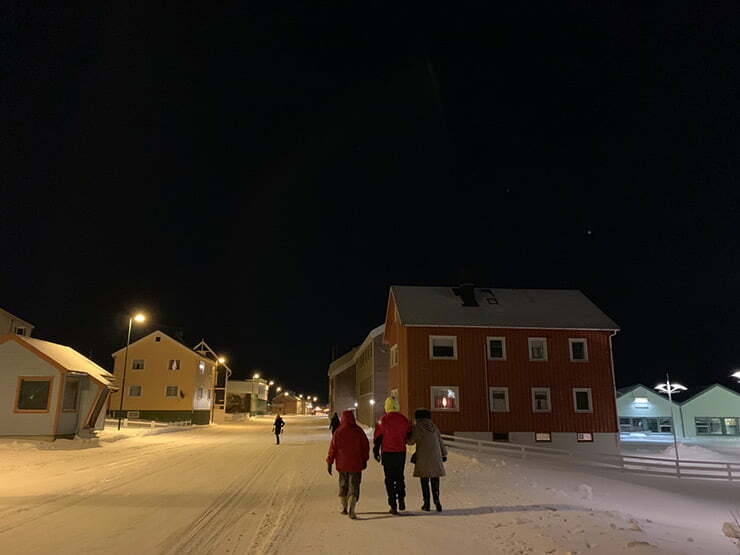 I only discovered this recently, but Vardø is known for the witch trials in the winter of 1662–1663, although people had been accused and killed for many years before that. About 150 people were executed for sorcery in the region over a period of 40 years, including many Sami men. 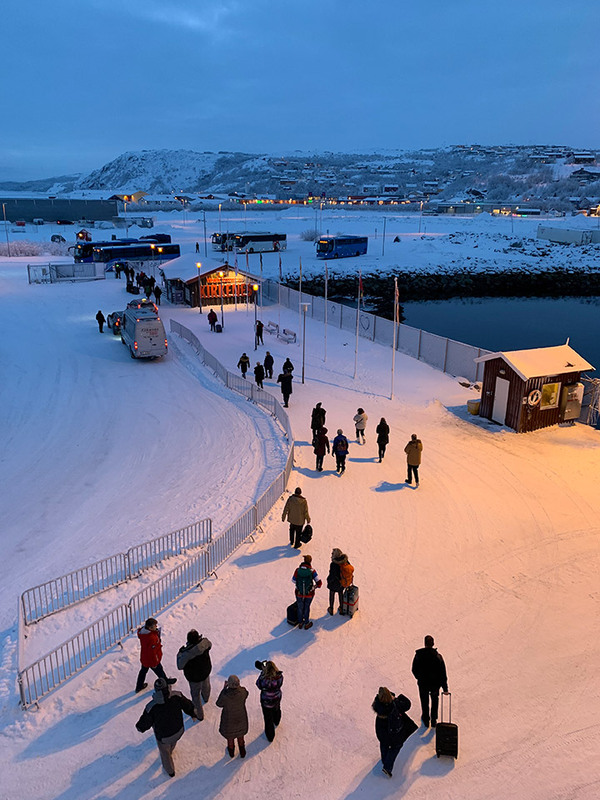 In 2011, a memorial was built on Vardø beside one of the country's national scenic routes to commemorate those killed along with other cases of genocide. I'll be back to see it in much more detail another time. Back on the ship, I was fortunate enough to receive an invite from the Chief Officer to have a chat and see the bridge. What struck me most was how dark it is up there. The only light is from the radar and navigation screens and various small control panels. It was otherwise pitch black and it took me almost five minutes before I could see the face of the two people I was talking to! 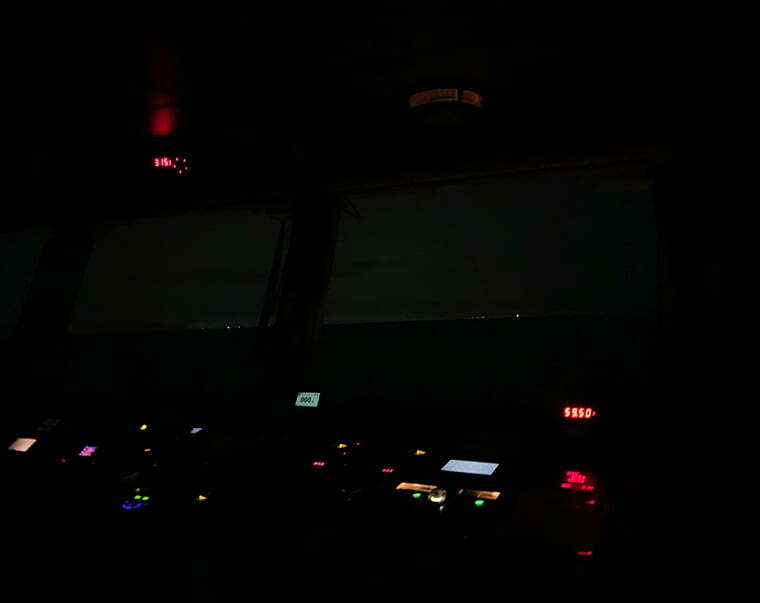 There are always two people on the bridge of the MS Vesterålen: the Captain or Chief Officer who is the person in charge, and a navigator. Another notable point about the bridge was how quiet and calm everything was. It felt surprisingly relaxed to begin with, but I soon realised this was more about focus than relaxation. I asked many questions for the upcoming book and podcast including how their role changes during storms and when approaching ports, plus lots about life on the ship. 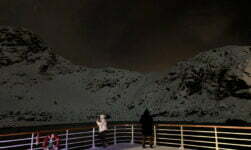 There's been no northern lights since the glimpse by the Trollfjord, which has disappointed some passengers. I happen to know from a reader who is following my journey from two ships behind that they've been a lot luckier! We wait to see if we will enjoy the same luck now we are coming into some clearer weather. I am really enjoying the blog. 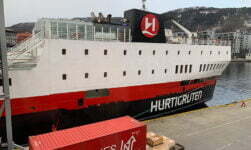 My wife , daughter and her partner are doing the voyage from Bergen to Kirkenes on March 7th on the King Harald. My daughter has done this trip already and persuaded us to do the same.